Definition at line 330 of file rpcndr.h. Definition at line 336 of file rpcndr.h. Referenced by init_user_marshal_cb(), NdrGetUserMarshalInfo(), test_marshal_VARIANT(), test_NdrGetUserMarshalInfo(), and UserMarshalCB(). Definition at line 332 of file rpcndr.h. 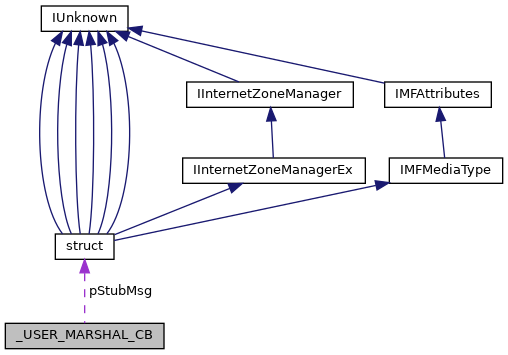 Referenced by init_user_marshal_cb(), marshal_STGMEDIUM(), marshal_WdtpInterfacePointer(), NdrUserMarshalBufferSize(), NdrUserMarshalFree(), NdrUserMarshalMarshall(), NdrUserMarshalUnmarshall(), test_marshal_BSTR(), test_marshal_CLIPFORMAT(), test_marshal_HBITMAP(), test_marshal_HBRUSH(), test_marshal_HDC(), test_marshal_HENHMETAFILE(), test_marshal_HGLOBAL(), test_marshal_HICON(), test_marshal_HMETAFILE(), test_marshal_HMETAFILEPICT(), test_marshal_HWND(), test_marshal_LPSAFEARRAY(), test_marshal_SNB(), test_marshal_VARIANT(), test_NdrGetUserMarshalInfo(), and UserMarshalCB(). Definition at line 337 of file rpcndr.h. Definition at line 334 of file rpcndr.h. Referenced by test_marshal_VARIANT(), and UserMarshalCB(). Definition at line 333 of file rpcndr.h. Referenced by init_user_marshal_cb(), marshal_STGMEDIUM(), marshal_WdtpInterfacePointer(), NdrGetUserMarshalInfo(), SNB_UserFree(), SNB_UserUnmarshal(), test_marshal_VARIANT(), test_NdrGetUserMarshalInfo(), and UserMarshalCB(). Definition at line 338 of file rpcndr.h. Definition at line 335 of file rpcndr.h.